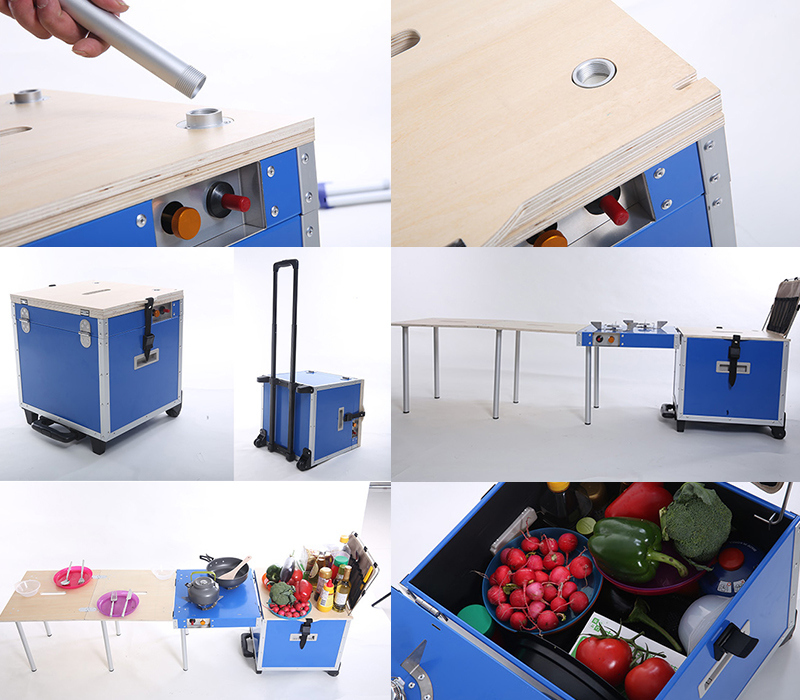 The Ultra-EatCamp Box,which integrated with the incubater table,two gas stove ,kitchen utensil frame and folding table into one for outdoor trip. The EatCamp only needs 30% space of the normal outdoor products put in the car.It alleviates the situation that vehicles can't store objects. The EatCamp has a lot of space ,as large as 40L,to store food,drinks,utensils etc. Expand the folding table,and it's large enough to be seated with 4 or more peopleÂ and make the overall appearance more concise and smooth. You can put the utensil frame out of the box to pack all your cooking utensils. With professional baking plate ,food ingredientsÂ can be fried, Â roasted, steamed, boiled stewed,camping Â is like home. Eat what you want and make yourself be a tasty eater. The EatCamp Box is only 7.4kg net weight,which is so easy to be carried by our children. Paste sink design, soft and delicate thread quality, concise but not simple,Double-wheel pull rod design, four-wheel load-bearing, silent to make the journey no longer dull. New CNC large forging bending equipment, laser technology Â cutting and molding without sharp dead angle,Reinforcing support, not shaking. The Ultra-EatCamp wind-shied has improved the size from the traditional Â to increase the efficiency by 30%. Combined with the character of the birch and the food grade of the surface treatment technology ,the wood's antiseptic and anti-oxidation efficiency is improved,and also the wood's life is prolonged,making outdoor life more tidy and hygienic.